Well, at the risk of annoying the purists, it’s certainly working for Northcliffe South East, one of three regions that make up Lord Rothermere’s local newspaper network. I was passing through Surrey’s Mole Valley when I stopped at a garage specifically to buy the local rag and was so impressed at the front-page editionising that I shelled out 2x 65p for both the Dorking Advertiser and its sister Leatherhead Advertiser. 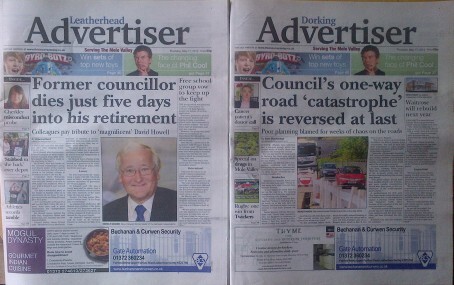 ‘Council’s one-way road ‘catastrophe’ is reversed at last’ was the Dorking splash, highlighting poor planning that caused weeks of road chaos for the town’s motorists; ‘Former councillor dies just five days into his retirement’ was the Leatherhead splash, reporting on the death of a well-known and popular local councillor. Neither tale was a world exclusive, but both were intrinsically local and of interest to readers who care about people and issues in their local area. And while Northcliffe – along with other publishers – is often scolded for its less successful local media experiments and cost-cutting controversies, it deserves praise here for maintaining the resources that allow proper editionising. It wasn’t just the splash either; both editions on Thursday 17 May also changed the right-hand second lead – ‘Waitrose will rebuild next year’ in Dorking, and ‘Free school group vow to keep up the fight’ in Cobham, served by the Leatherhead edition. The three left-hand editorial blurbs also changed, all six expertly subbed into catchy mini-headlines to draw readers in: ‘Cancer patient’s donor call’, ‘Special on drugs in Mole Valley’ and ‘Rugby: one from Twickers’ in the Dorking edition; and ‘Cherkley misconduct probe’, ‘‘Stabbed in the back’ over depot’ and ‘Athletics records tumble’ in Leatherhead. What really impressed me was that the local Northcliffe team are still driven to do this for papers that are not even its best-sellers. It’s often titles like the Essex Chronicle that get the attention of media-watchers, still impressing with its 27,500+ circulation, whereas the Dorking and Leatherhead Advertisers only sell 9,154 between them – 5,440 in Dorking and 3,714 in Leatherhead. But the fact that the journalists work hard at displaying specific stories to make each edition as attractive as possible is commendable and is surely preventing a faster decline than the current seven per cent. None of this is quite so surprising when you realise the editor-in-chief for Northcliffe South East is Alan Geere, someone who in his various guises over the years has earned my respect as one of the best local journalists I have known. It’s typical of him to insist that even his smallest paid-fors in a 40-paper mini-empire are given the same quality treatment as the largest by the Chelmsford-based central subbing unit that he proudly boasts is “the country’s biggest (and best!)”. Yes, I suppose I’m waxing lyrical about ‘Zebedee’ Geere, but it’s always such a joy to hear his positive comments on the media at a time when so many are in the morale doldrums. He was at it again on BBC Essex during the recent Local Newspaper Week: “Of course the future is challenging for us as digital takes hold of our traditional advertising platforms of jobs, cars and houses,” said Alan. He then reminded listeners that the Chronicle has 100,000 readers a week – “the old Wembley Stadium full to the brim” – and that more than 90 per cent of the Chronicle’s content “is unique and cannot be read anywhere else, either in print or online”. With an enthusiast like that his leading his editorial teams, it’s no wonder the Chronicle was voted Britain’s best weekly newspaper for the second year running in the Society of Editors’ Regional Press Awards. ‘300-plus crimes in one year are linked to drugs’ spread over pages 10 and 11. I particularly liked the attention to detailed local reporting in the ‘Villages’, ‘Education’, ‘Valley Voice’, ‘Yesteryear’ and planning applications sections. In 124-page papers, I counted around 185 stories on 33 news and features pages in each edition, another 46 reports on eight sports pages and a 40-page ‘FindaProperty.com’ section. So while Geere gets applause for central-subbing leadership, hats off to news editor Alex Morrison and the local reporting teams for what was consistently good content. Well done Alex and his team. Both Dorking and Leatherhead Advertisers are solid local papers doing working which often goes unmissed when compared to (as Steve points out) the Essex Chronicle. Central Subbing !, they are editions of the same newspaper, nothing ground breaking there ! Why is the successful production of two newspapers from the same editorial team attributed to central subbing when presumably this was managed quite well in the past, before subbing was centralised? My two local JP freesheets operate in an identical manner, delivering different content from the same team. They did just that when subbing was done locally. The only contributions central subbing has made are the poor layouts, grammatical and spelling errors. I hear you, ‘Spanner’ and ‘Tog’. What I was trying to say (obviously not very well) was that central subbing is often derided for killing off editionising, with little will/resource to continue such local detail once subbing teams are removed to a central location. This example shows real dedication to continue quality editionising on the smallest of editions. It therefore is, I am arguing, ‘central subbing that works’. Alan Geere can come across as a bit hyper, but he knows how to make a newspaper look beautiful. Steve – fair enough, but surely it would always work because regardless of the location of the sub, they’re subbing content produced by the local editorial team? A more newsworthy story would be editionised papers that still work after local office closures. Hate the square picture format on the front ……arrgh… have they never heard of the golden ratio- 4:3. But what do I know, I’m only a photographer! 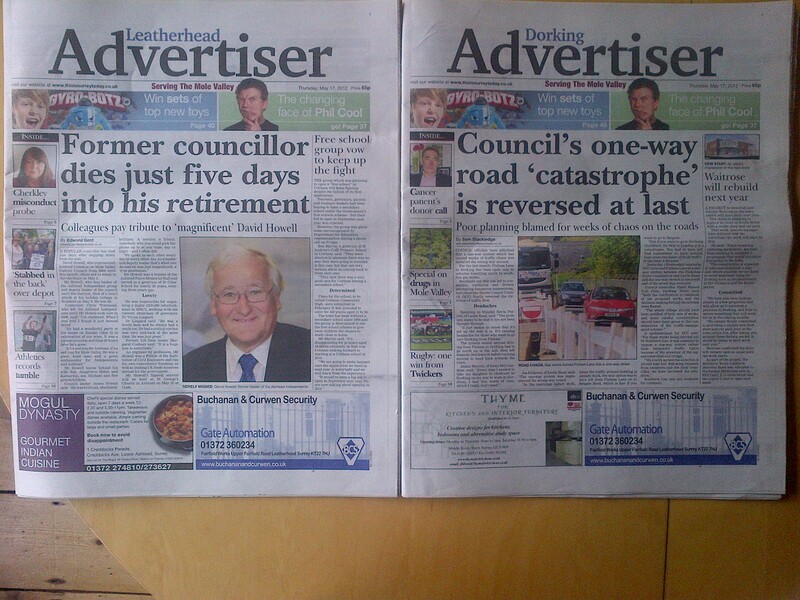 The two papers in question used to be produced by a smaller centralised subbing unit based in Reigate. You will have to go back to the mid-eighties when they were subbed in Dorking. As for those who critical of the design, let me say that the best-selling editions are the ones that have the best front page stories – and NOT the best designed front page. Of course the ultimate goal is to achieve both. Design is the icing on the cake. It is purpose is to serve the content. However, without a good “cake” a good design can be counterproductive, as the readers would feel cheated, especially in upmarket products. The saying “fur coats and no knickers” comes to mind. Steve – are you the real SD — if you are you have lost it! This paper front page is a mess. If a one-way road scheme is reversed won’t it remain one-way albeit in the opposite direction?